Several NFL players have joined Colin Kaepernick in protesting about racial inequality on the NFL’s opening weekend, which also marked the anniversary of the 9/11 attacks. San Francisco 49er Colin Kaepernick’s refusal to stand for the national anthem at the start of each game in pre-season has divided opinion. While many have backed Colin Kaepernick, others say he is disrespecting the American flag. However, several players raised fists or knelt to support Colin Kaepernick’s aim to highlight oppression of black people. Four Miami Dolphins players – Arian Foster, Jelani Jenkins, Michael Thomas, and Kenny Stills – knelt as the Star Spangled Banner played. Their opponents, the Seattle Seahawks, locked arms as they stood. Kansas City Chiefs players also locked arms to show unity while the player at the end of their line, Marcus Peters, raised a black-gloved fist – a gesture reminiscent of US sprinters Tommie Smith and John Carlos as they stood on the podium following their 200m final at the 1968 Olympic Games in Mexico City. “It was our goal to be unified as a team and to be respectful of everyone’s opinions, and the remembrance of 9/11. “It’s our job as professional athletes to make a positive impact on our communities and to be proactive when change is needed,” a statement from the Chiefs players after the game said. Miami Dolphins player Jelani Jenkins said: “I chose to get involved to see if I could create change, raise awareness. “I want to make it clear that there is no disrespect to the military or to police officers – I’m not about that. Seattle Seahawks players and staff had been in talks before their game to discuss how best to show support, and wide receiver Doug Baldwin said they wanted to meet with the mayor of Seattle and local law enforcement. “We know that there has to be change and progress, but you got to apply direction to change,” he said. In the late game, New England Patriots’ Martellus Bennett and Devin McCourty both held up their right arms, while team-mate Danny Amendola was seen to grab the unfurled American flag on the field during the anthem. In September 8 season-opener between the Denver Broncos and the Carolina Panthers, Denver linebacker Brandon Marshall knelt during the national anthem. 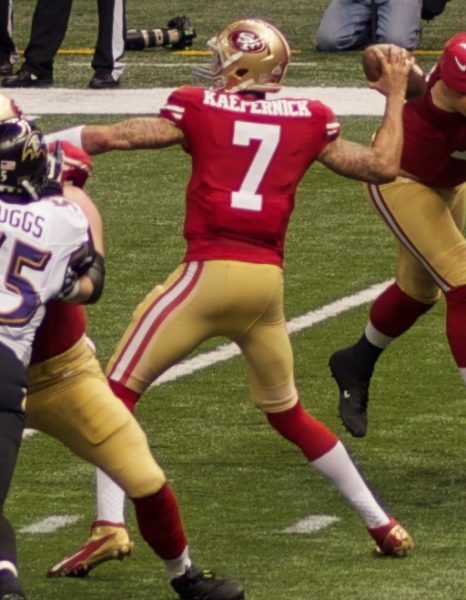 Colin Kaepernick’s team plays the Los Angeles Rams on September 12.